Greetings. Unfortunately, there was an error committed in printing out the race bibs. Some race bibs have a bar code and some do not have one. Do not worry as you will still be able to run your event and you will still be timed accurately. We have corrected this situation already with race bibs that have not yet been issued out. 1. Write down your bib number on the perforated stub located at the lower left side portion of your bib.The portion that says: “Give to finish official at the end of the race”. “Do not pin spindle hole”. For example. 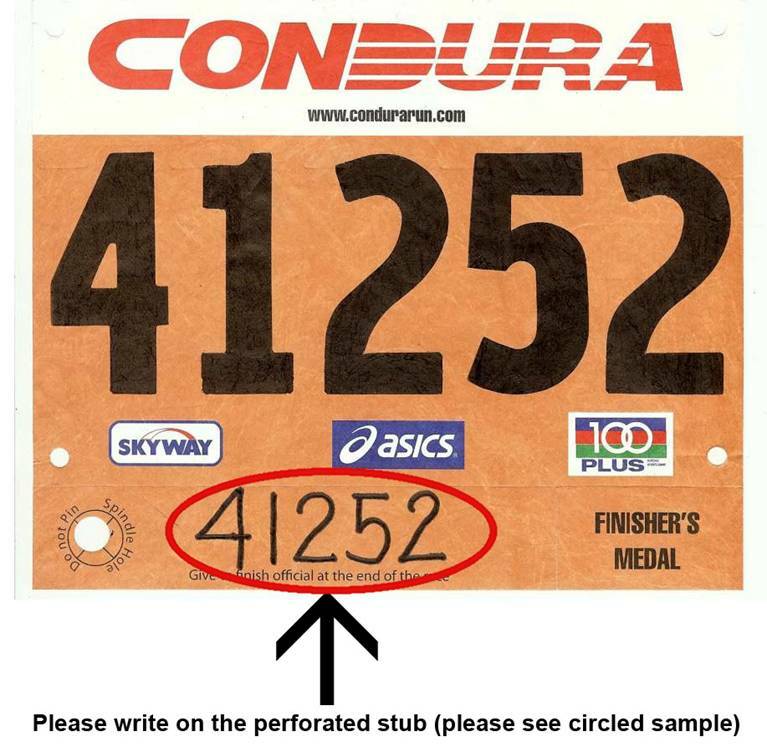 If your bib number is 123, please write the number 123 on the perforated stub. Please see attached sample. 2. Please write clearly, legibly and accurately. We are very sorry for this basic error. We are sorry for the inconvenience this has caused you. We are hoping for your kind understanding. Upon receipt of this email and upon making the necessary changes kindly email us at secretariat@condura.com or text us at (0908) 880-8354. The Condura Run Organizing Committee. « The Best Things in Life Are Free!